You’ve just found your new crafting space! 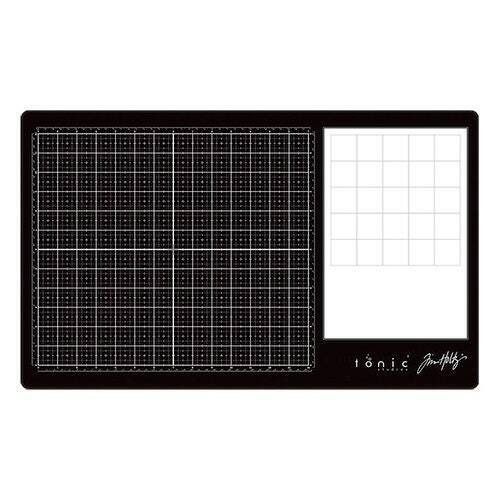 The Glass Media Mat designed by Tim Holtz for Tonic Studios is the perfect multi-functional tool that every crafter and artist needs. This mat is designed to be your workspace and your messy space. So, if you love to scrapbook, make cards, paint, create mixed media art or you enjoy working with polymer clay; this is the space that you need to make your one-of-a-kind pieces. This crafting space works great at your kitchen table, in your craft room, even at a crop or a class. You can even use your rotary tools and craft knives without damaging the glass surface. This is YOUR space to create! What is the Glass Media Mat? Use the mat for projects that you use a lot of glue, paint, gesso and anything else; your mess won’t get in the way of creating your masterpiece. When you’re done creating, simply remove the craft mat and wash it off, it’s that easy! You can clean it by placing it in your dishwasher, rinsing it off in your sink or you can clean it with solvents. You can also blend your paints, markers, inks and more; use the black glass portion of the mat to create an easy motion of movement on your surface to blend your ink or other mediums. Or on the white palette area, use a wet paint brush or water brush and pick up your chosen color; start having some fun by mixing your watercolors, distress inks, crayons, inks and more on the palette area. Water-based mediums will never dry on the surface. Try using your cube inks and mix and match your color choices for endless creative possibilities! So, now that you’ve read how awesome the Glass Media Mat is, you can bet that you’ll have hours of fun creating on your new workspace! Black tempered glass mat that has a 12” x 14” workspace. Features imperial and metric measurements. You can fit a 12” x 12” sheet of scrapbook paper and still have an inch on each side of your workspace. The ruler grid is underneath the black tempered glass mat, so no worries that the measurements will fade over time. Each square on the black glass working area measures 1” x 1”. The bottom features a ruler that measures from 0” to 14”, the side measures from 0” to 12” and the top has a zero displayed in the middle allowing you to easily center your projects. A removable, durable non-stick area that measures 7 ½” x 11”. The white craft mat is made of silicone on the back, which keeps it from moving around your workspace. The white palette area boasts a 25 square grid that can be used as your color palette for your project or for mixing; your mediums will not dry on this surface. Durable feet on the bottom of the mat that raise the mat slightly; gives you a barrier along the edges so that your tools keep out of your workspace.